Back to our giveaway. 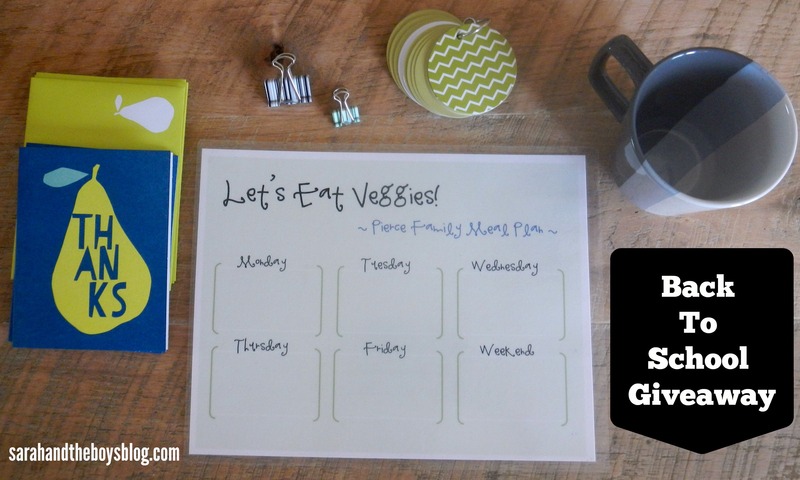 Yesterday I shared my little meal planner and my modest design with you. Today I’m giving you the chance to win a finished, personalized copy, plus some other fun goodies! The theme was back-to-school organization. To enter, please comment below on your favorite thing about late summer/early fall (back to school time). That’s it! If you want an “extra” entry, like Sarah and the Boys page on Facebook or Instagram (link in sidebar). *Void where prohibited by law. No purchase necessary. Available to anyone in the contiguous United States, must be 18 or older to win. Winner will be chosen at random and contacted via email. Deadline to enter is Saturday, September 23, noon, CST. My favorite thing towards the end of summer/ early fall is back to school shopping, school supplies and decorating for Fall. I love the new beginnings my kids get to experience. New teachers, classrooms, friends. It’s fun to bake cookies after school and hear all about their day! I love back to school time for so many reasons–a daily routine for everyone, a regular dose of friends and activites for the kids, and a quiet house for me. Of course football season is the best, and the cooler days with that hint of fall in the air is just the best. Must be why fall is my favorite season! I love getting back into a routine, days where it’s a wee bit cooler yet still nice enough to be outside (not this week! ), and getting one on one time with my little guy still at home. I like getting back into a routine, decorating for Fall, and getting to spend some one on one with my youngest still at home. My favorite thing is getting back into a routine and cooler weather! Fall is my favorite! New school supplies, pumpkins, apples, leaves changing… Bring it on. Also, I want ALL the bonus entries because I like you everywhere, even Twitter! My favorite thing THIS YEAR is seeing my baby so excited about starting Kindergarten and my oldest excited about starting middle school. It makes me proud to watch them grow into the loving, strong willed, and independent children I always hoped they’d be. My favorite things about fall and back to school time are the cooler temps and the return to a consistent routine. And I’m liking you on Facebook. Sorry if I should have included that in my first comment. Mizzou football and everything PUMPKIN! This is tough, because I’m sad when summer is over. I am loving how excited my son is for school; it’s contagious! I also love the freshness that comes with the changing of seasons. September and October are usually the busiest months for me. It seems there is some great get-together (or two) going on every weekend! Oh the choices! And the dances! And the wiffleball games! And the overnight float trips! And the hot cider! I love summer but love it even more when it’s over. 😉 This time of year I love a return to routine and the freshness of a new school year. I am always sad summer is over but I do enjoy getting back in a routine. I also enjoy watching my daughter’s soccer games and MU football. M is just starting her second year of preschool (please come sooner preschool start date. We both miss you). We don’t do school supplies but I do love school supplies. I have discovered fine point sharpies and they have changed my life! Anyway. Amdrew loves football. I used to pre-children. Now I look forward to the trees changing and pumpkin patch-ing.